Camp Bacon Gift Box for sale. Buy online at Zingerman's Mail Order. Gourmet Gifts. Food Gifts. Camp never tasted so good. 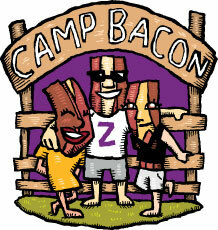 Camp Bacon is an annual festival of your favorite meat held right here in Ann Arbor, Michigan. It's held the first weekend in June each year. While we wait for the return of Camp Bacon in June 2019, the Camp Bacon Gift Box is a treasure trove of eats and treats for the bacon lover, the bacon fanatic, the bacon lunatic. We pack our cartoon printed gift box with three of our most popular bacons: Nueske’s Applewood Smoked from Wisconsin, Peppered Bacon from Arkansas and Hickory Smoked Duroc-breed Bacon from Indiana; then we tuck in a loaf of Peppered Bacon Farm Bread from Zingerman’s Bakehouse, a Bacon Chocolate Bar from Vosges in Chicago, and our Bacon Pig Magnet.